TrackerPoint brings over 25 years of 'real-world' RFID innovation and "know-how" to every project. Demonstrated in over 300 deployments since 1989, our experience includes working with all forms of RFID to ensure the most appropriate choice for your project and environment - fully integrated into our XALiNK software. ​Introducing XALiNK: the newest technologies and services integrated into one intelligent X-Application framework. 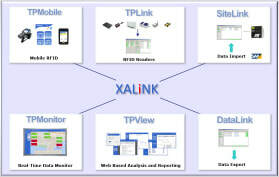 XALiNK is designed from the ground up to connect and to configure. XALiNK has implemented 300+ RFID projects worldwide. ​If you don't see what you're after - then please do get in touch to discuss as we've almost certainly deployed it!